1. While painting these out seen area, try to add some colour which can be brighter and gives the illusion of space. Not only does colour create a good environment but is also believed to wade away the negative energies. 2. Try to figure out the time you would like spend more in the balcony. Would it be during night or day? For instance if it’s night, then try decorating with some lamps and scented candles to make it look peaceful, exotic after a tiresome day. 3. Balconies with smaller spaces need to be carefully assessed. Do not miss even an inch or any nook and corner. Try to utilise them creatively to either look more spacious or add more depth. 4. 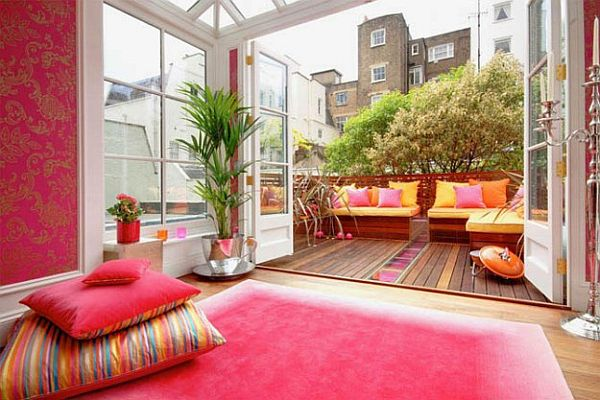 Plants can be one of the biggest assets of furnishing that can be added to a balcony. If it is a big and spacious one then try to add a ground level planting provided there is enough sun light which directly falls on them. On the contrary, if the balcony is slightly on the smaller side try to hang pots near the corners, or grow some on the walls which will give it more space to move about. 5. A lot of people try to dump their old unused and waste materials in the balcony. If only a little bit of effort was put into cleaning the wreck it will be magnificent. Clear out all the junk and add cosy small chairs or mats (preferably water resistant ones). And then add a small table to enjoy a tea/coffee.